Louis Solitaire uses 104 cards (2 decks). You have 12 tableau piles with 8 cards per pile and 8 foundations. An Ace and King of each suit are removed from the deck to form the foundation piles. Cards are dealt to tableau piles in clockwise order. All suitable cards are automatically moved to foundations. So each pile can contain eight cards or fewer. Build the aces up in suit to kings, and the kings down in suit to aces. You may build tableau piles up or down regardless of suit. Only a Queen may be built on a King (and vice versa). Only a Two may be built on an Ace (and vice versa). When any tableaus are empty you can fill the space with any single card. When you have made all the moves initially available, click on the stock pile to rearrange the cards in tableau piles. You have two redeals. On a redeal, all piles are gathered up in reverse order of dealing. 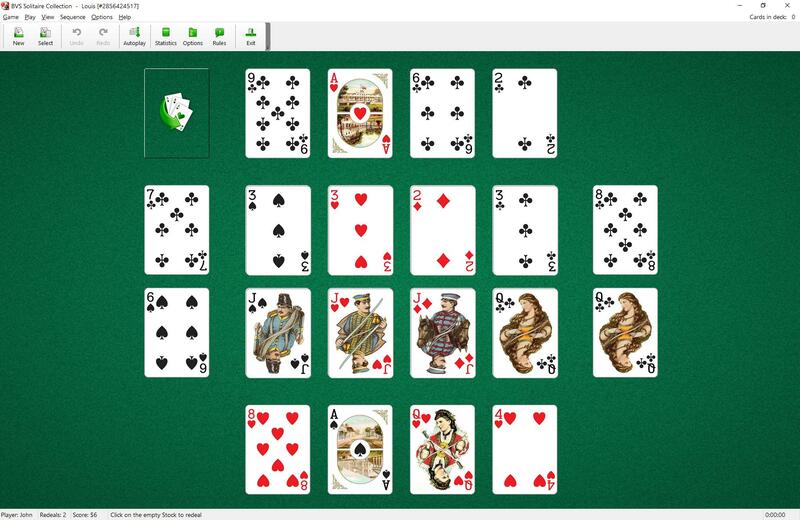 Louis Solitaire is one of the solitaire card games included into the BVS Solitaire Collection.